Remind yourself to enjoy the ride of life with this clever sterling silver necklace. There's no GPS when it comes to the journey of life, so you might as well enjoy the ride. Remind yourself to lean into any twists and turns that come your way with Amy Waltz's sterling silver necklace. She hand-casts "trust the journey" into its clever shape—because sometimes you end up at the most beautiful places when you ditch the map entirely. Handmade in California. 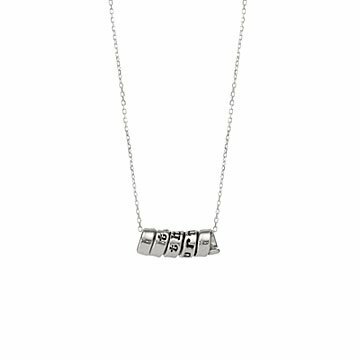 Pendant: .7" L x .1" W Chain: 18"
The words a clear and easy to read. It lays nicely. I like the message. I took off one star because the chain that it comes with is pretty cheap, but that is always the case with necklaces.